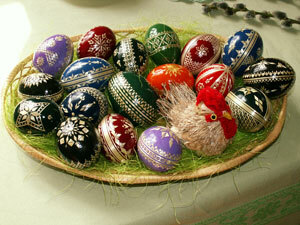 Orthodox Easter Day in Ukraine is different from the western church and follows the Orthodox Christian Church's calendar. People will attend special Easter services and people will get together with family and friends to eat lamb, walnut pound cake and painted eggs that were prepared earlier. This is a national holiday with government and business offices closed. The eastern Christian Church bases many of its holidays off the Julian calendar which puts Easter in the eastern church different from the western church using the Gregorian calendar.